​67006 tnt 67005 on the 1Y44 1014 London Victoria to Folkestone West at Swanley on the 8th May 2016. 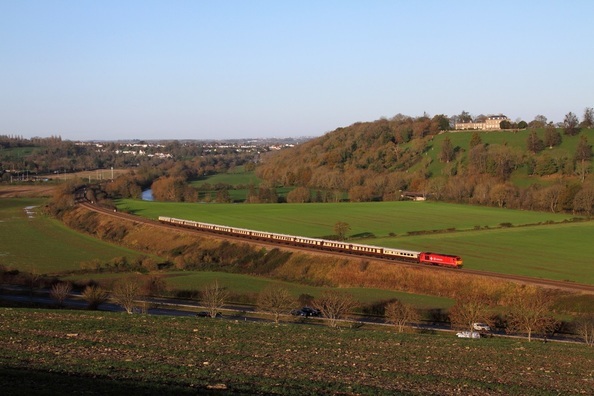 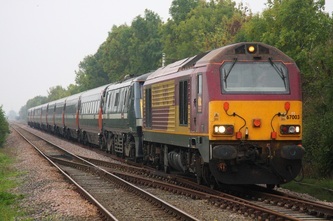 DB Schenker's 67018 works the 1Z16 Bristol Temple Meads to London Victoria Belmont British Pullman at Newton St Loe, Bath on the 21st November 2015. 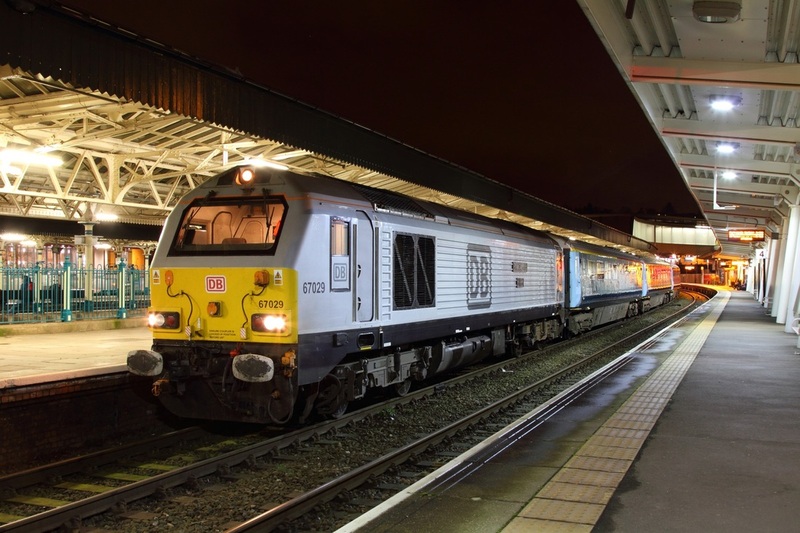 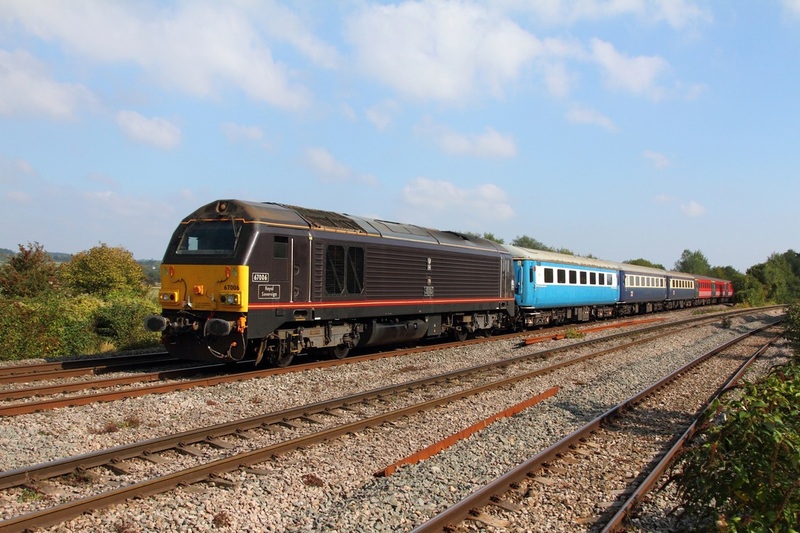 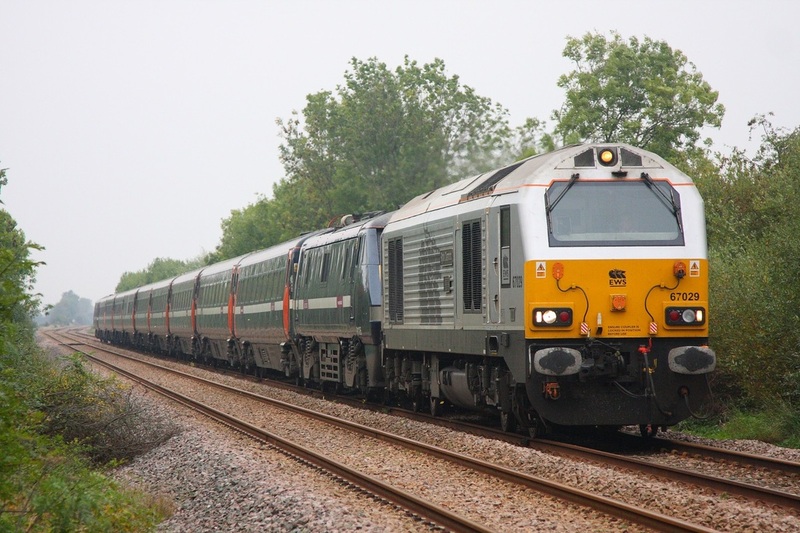 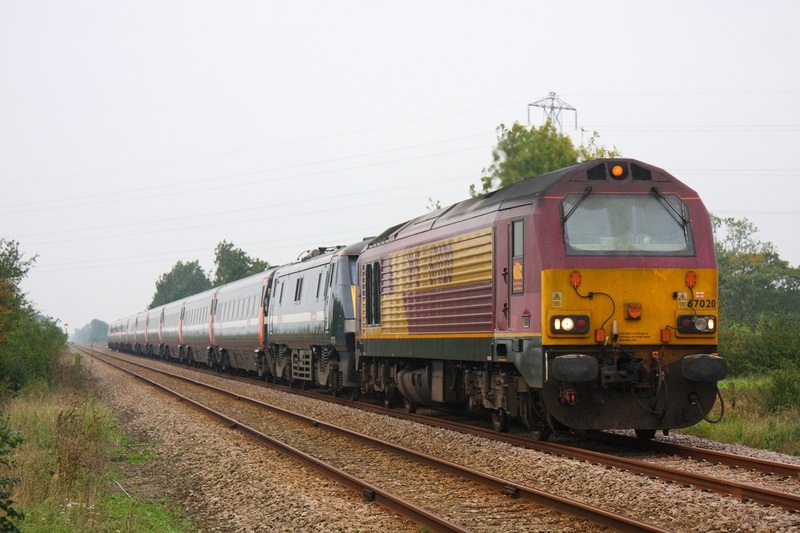 ​67008 tnt 67013 on the 1Z32 1233 London Paddington to Cardiff Central at Somerton on the 1st October 2015. 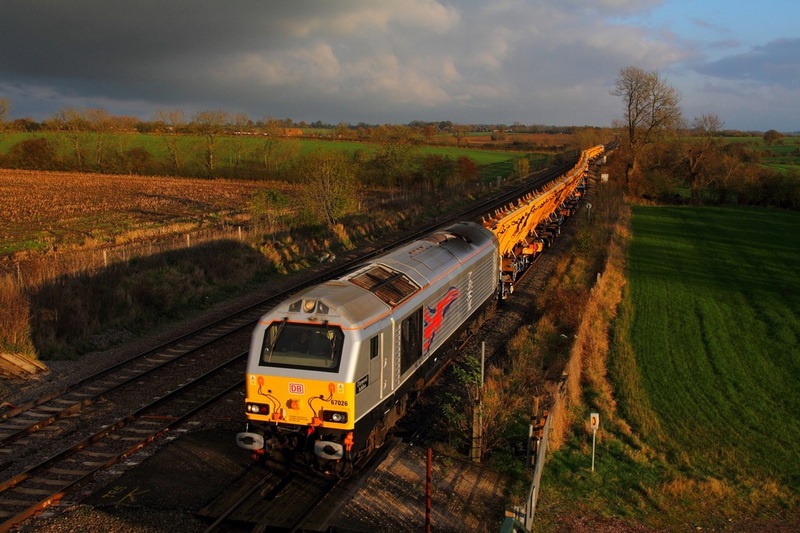 67025 hauls the 5Z79 11:10 Newport to Bristol Barton Hill at Bishton on the 9th February 2012. 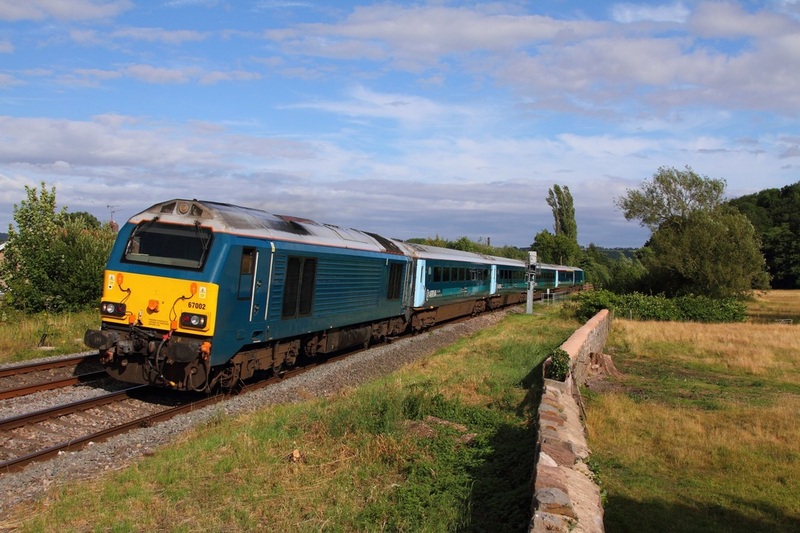 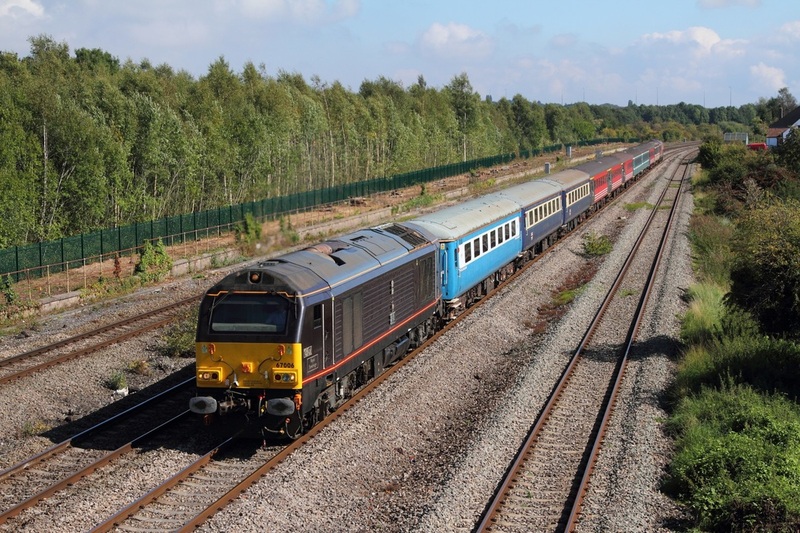 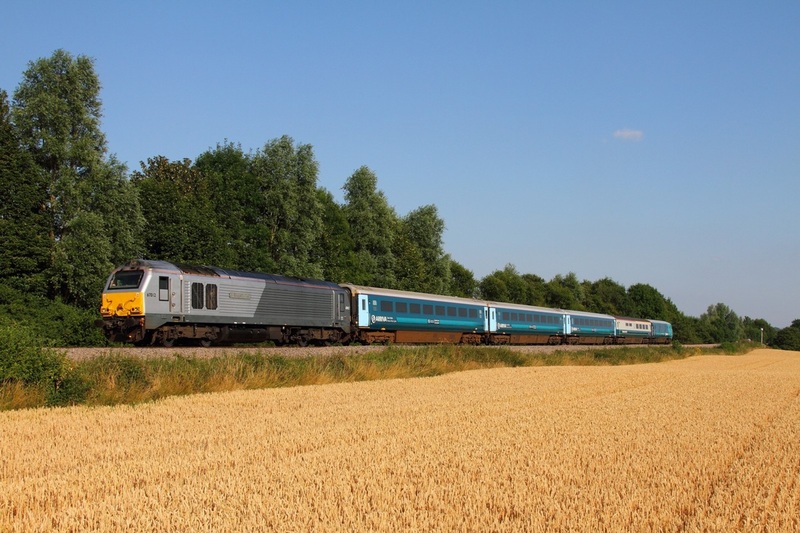 67003+5981+975091+67016 on the 1Q20 0750 Crewe CS to Derby RTC via Newport pass 175003 on the 1VV37 0830 Manchester Piccadilly to Milford Haven at Newport on the 7th August 2015. 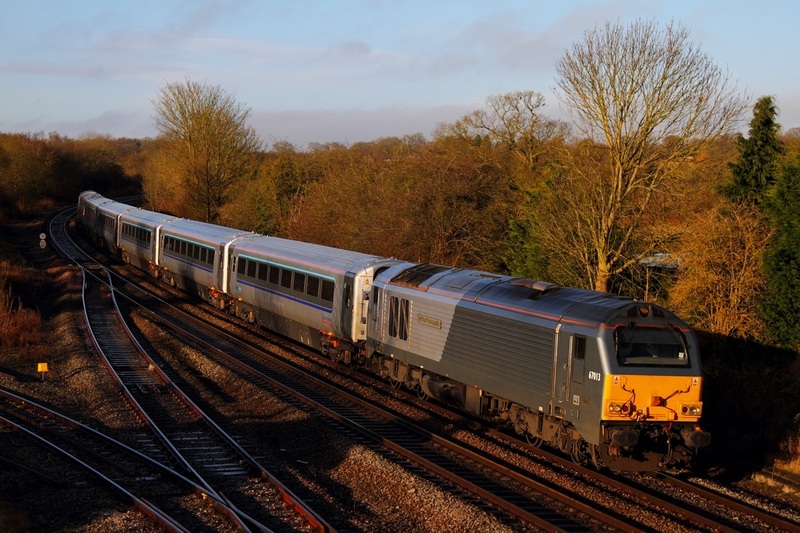 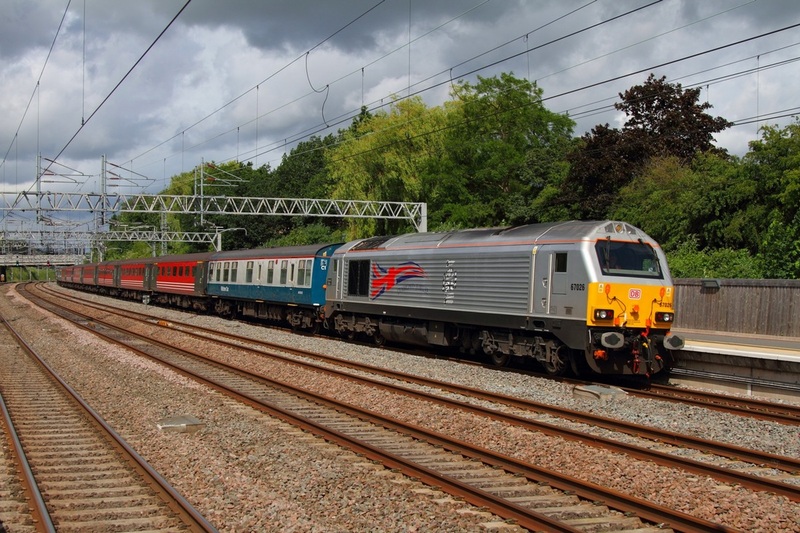 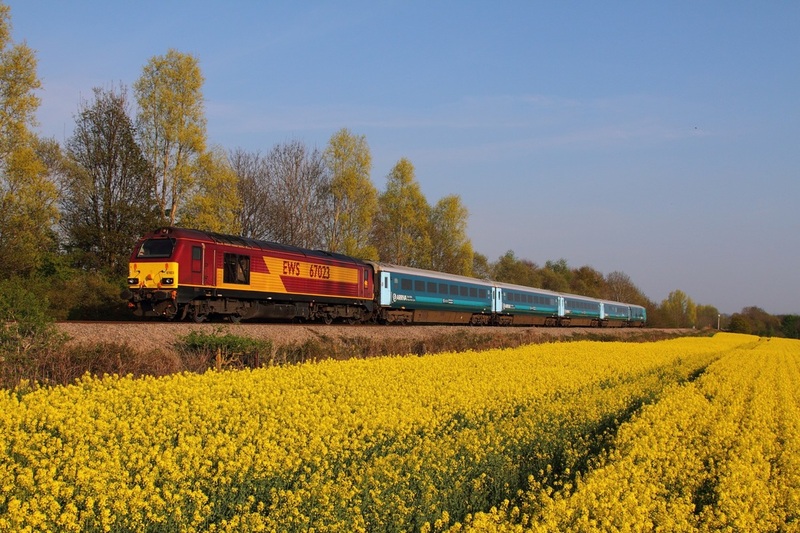 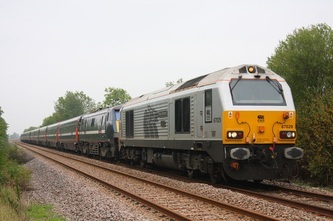 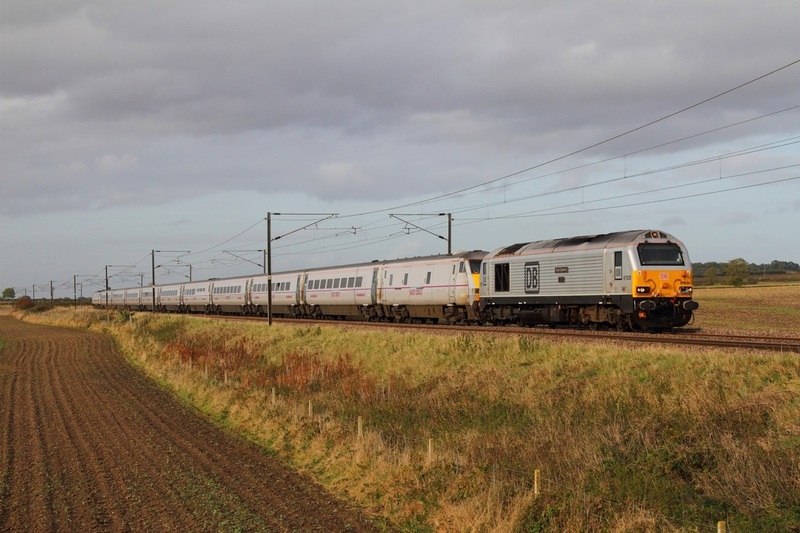 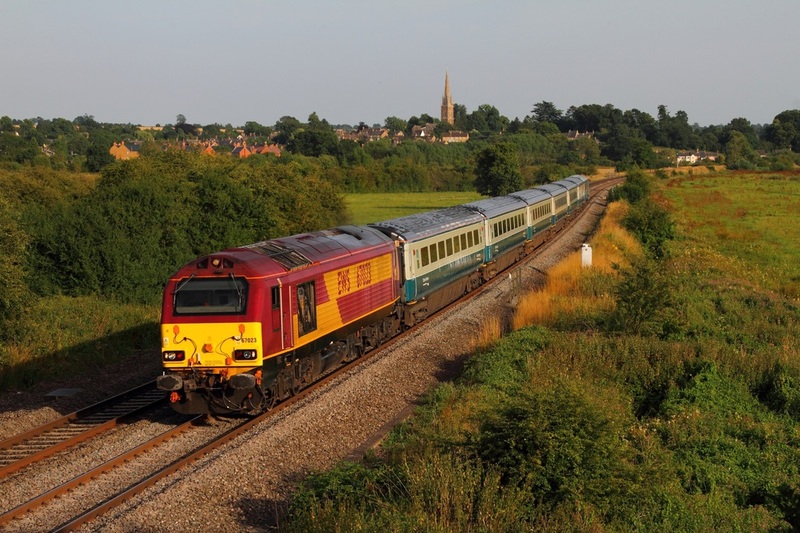 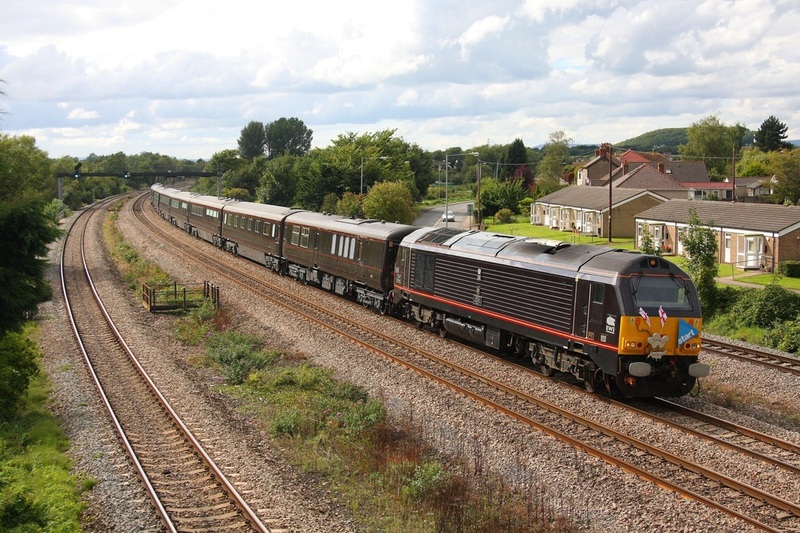 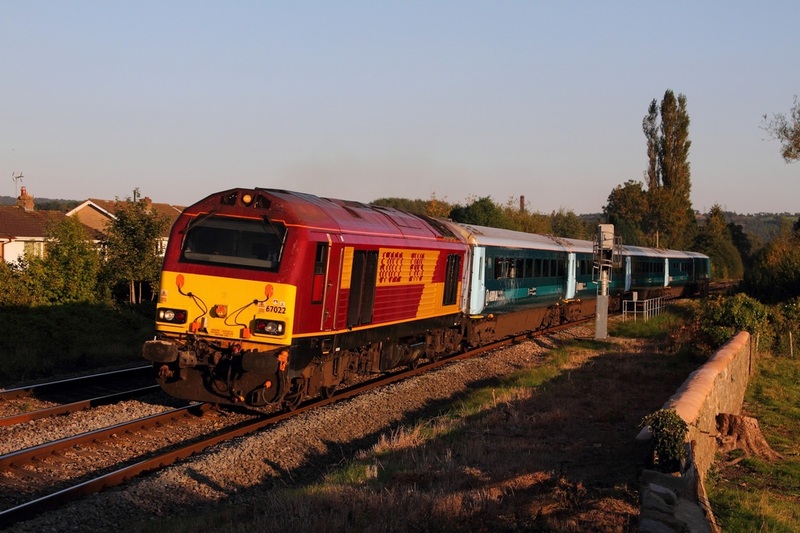 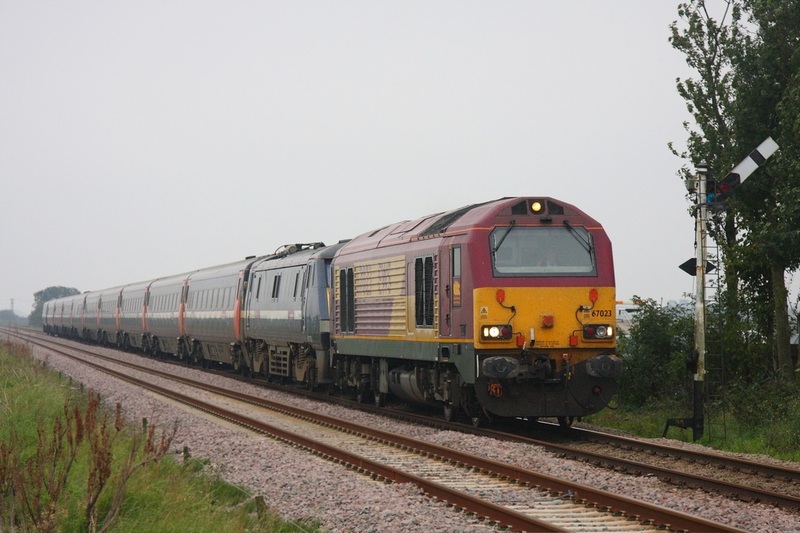 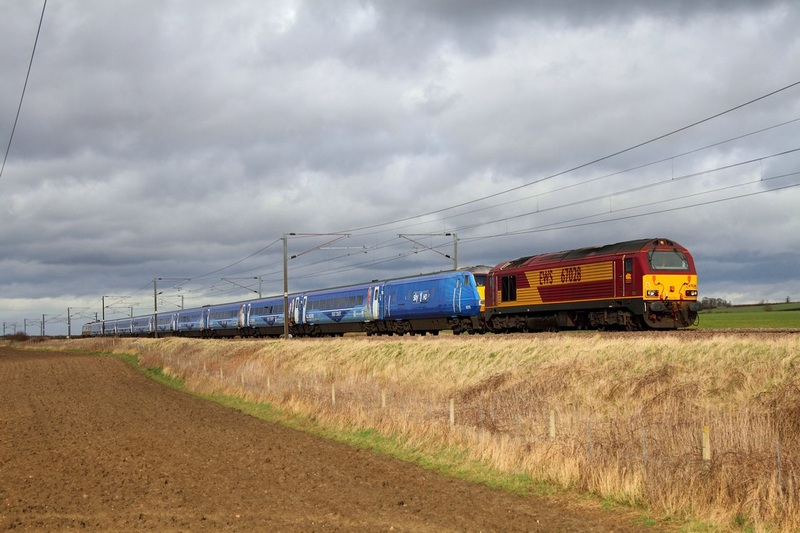 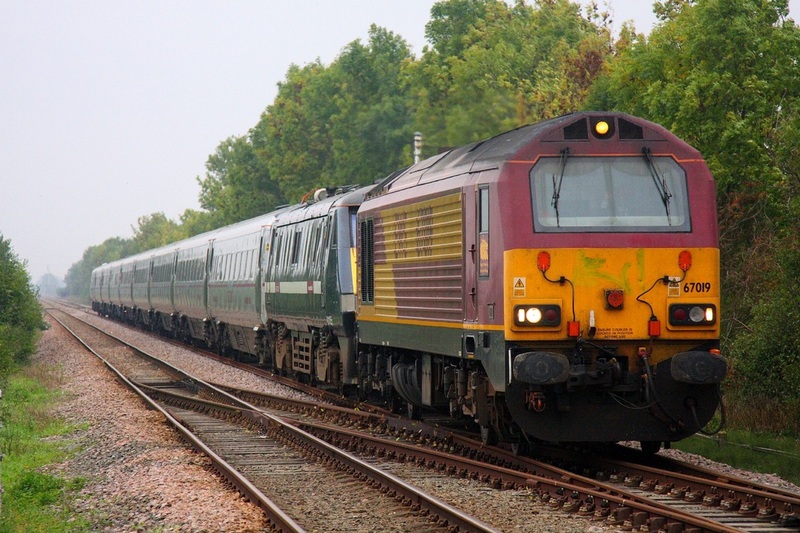 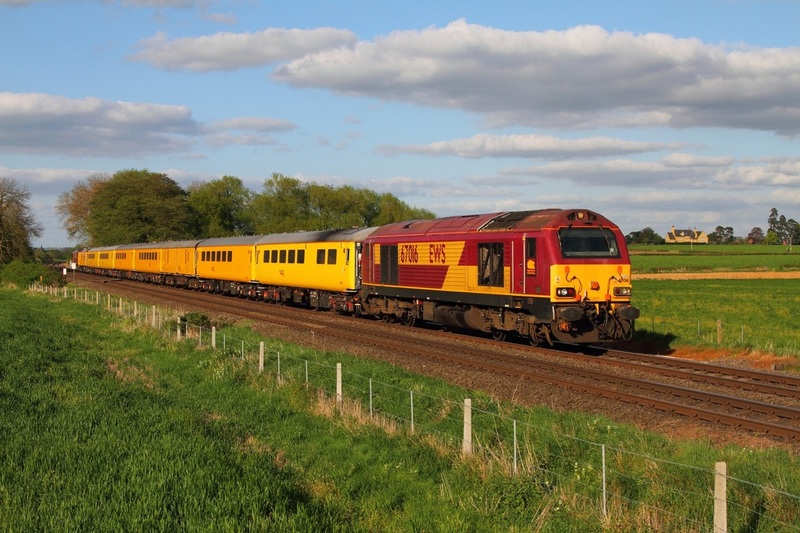 DB Schenker Silver 67029 leads 82223 and pantograph-less 91129 on the 1E06 Glasgow Central to London Kings Cross, running 257 minutes late at Marston near Grantham on the 17th October 2014. 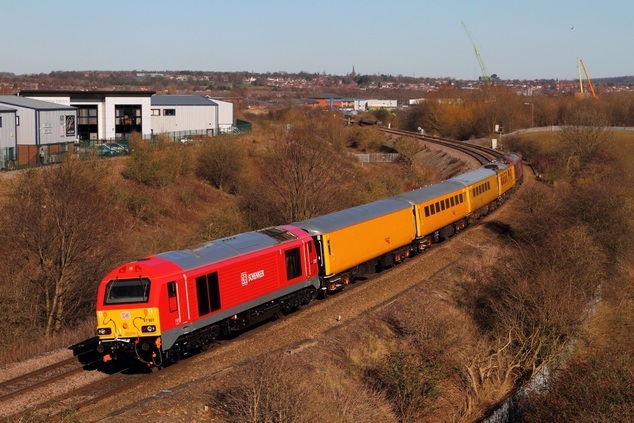 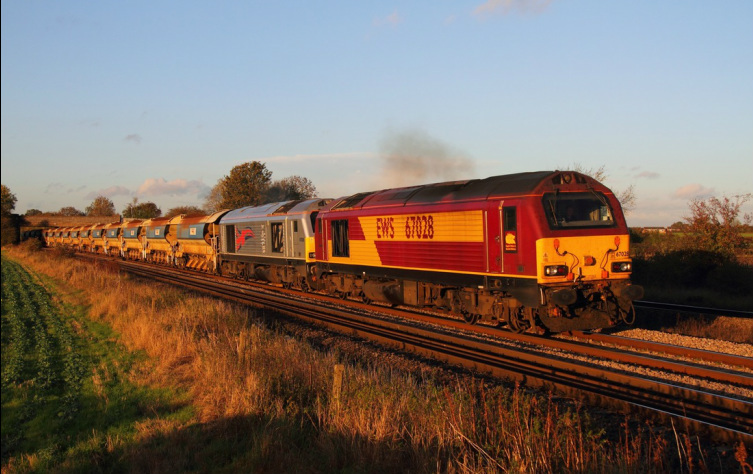 DB Schenker's 67026 leads classmate 67015 top-and-tailed with a rake of IFA side carriers working the 6X11 1024 Acton yard to Toton North yard at Kilby Bridge on the 17th November 2014 running 145 minutes late. 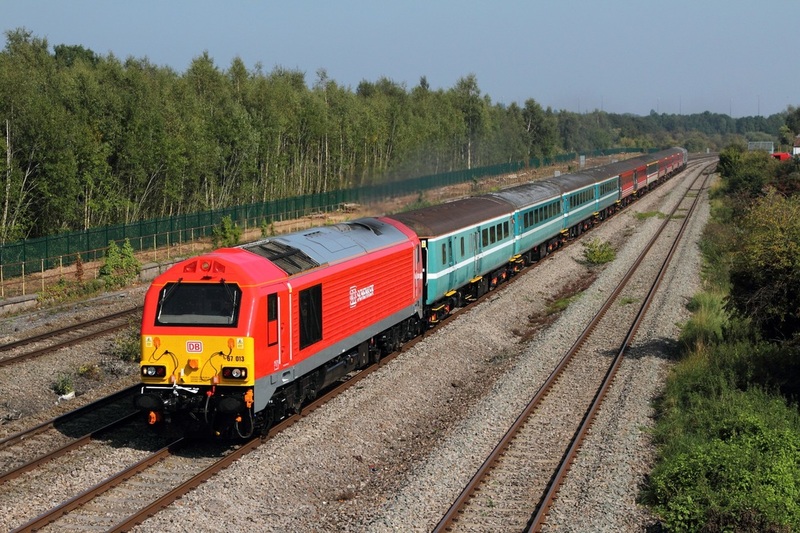 DB Schenker's EWS liveried 67007 hauls 325013 at Barrow upon Trent working as the 5Z25 Crewe IEMD to Toton on the 31st May 2015. 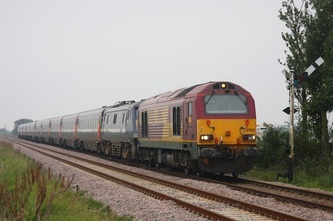 The train was slightly delayed after there were animals on the railway just north of Stenson. 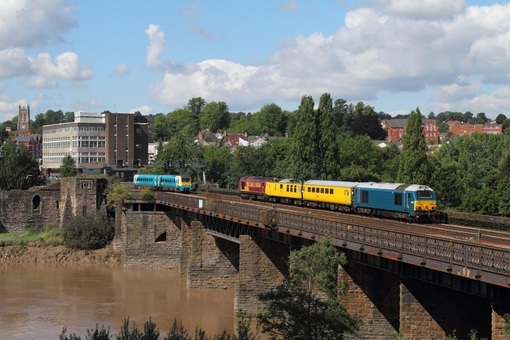 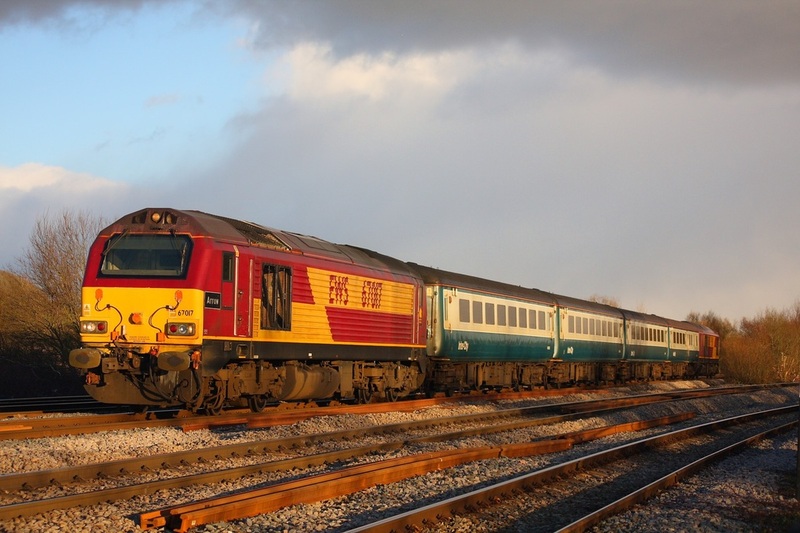 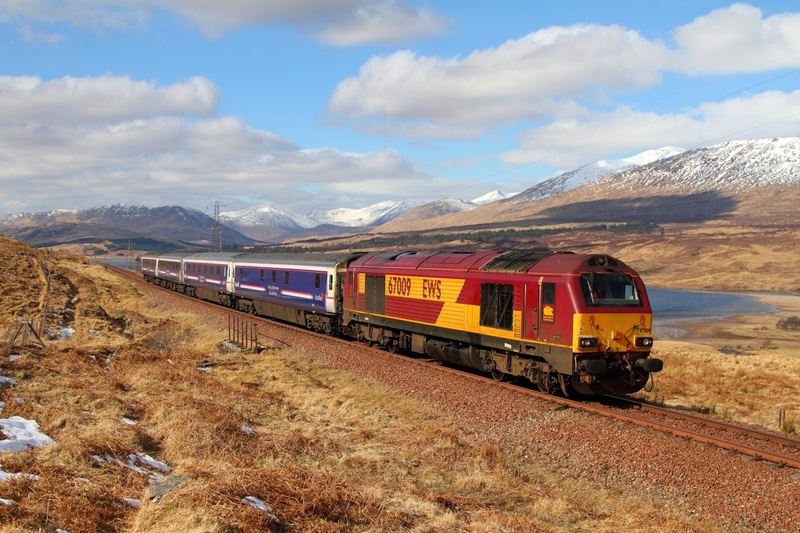 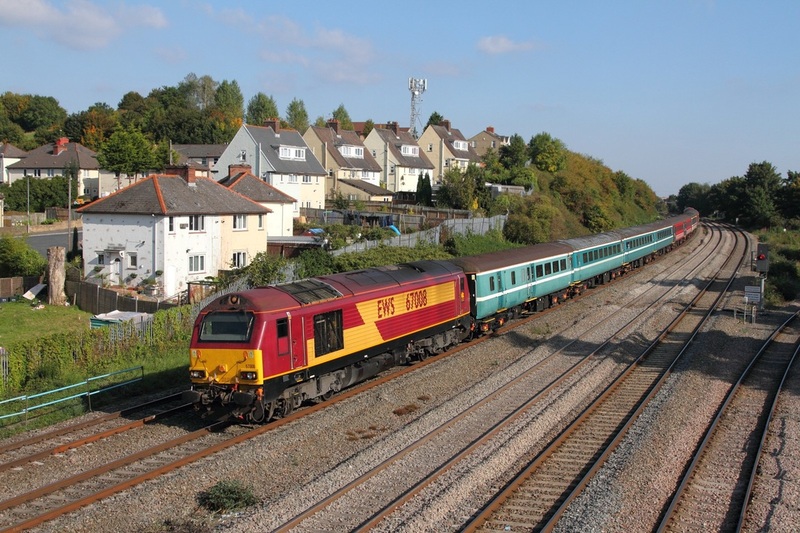 EWS liveried 67017 and 67016 were the two regulars on the FGW Loco-hauled diagram. 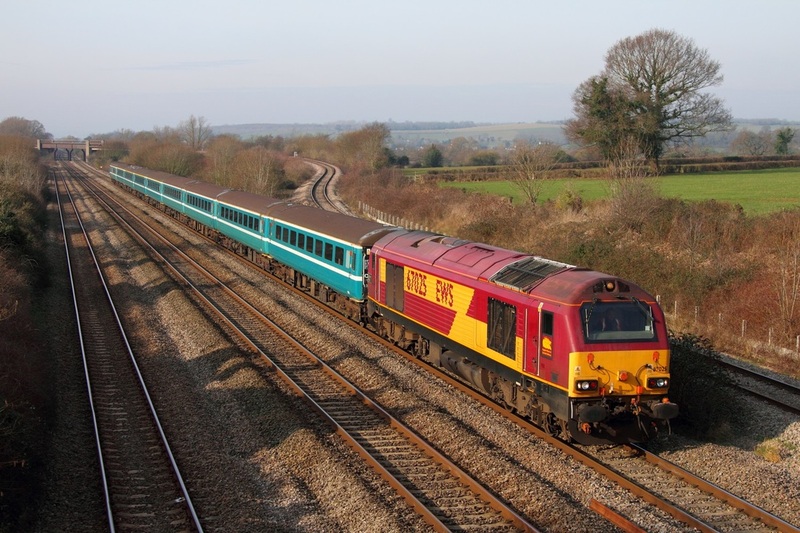 On the 29th January 2010, 67017 'Arrow' leads 67016 powering the 2U20 Paignton to Cardiff Central service at Bishton. 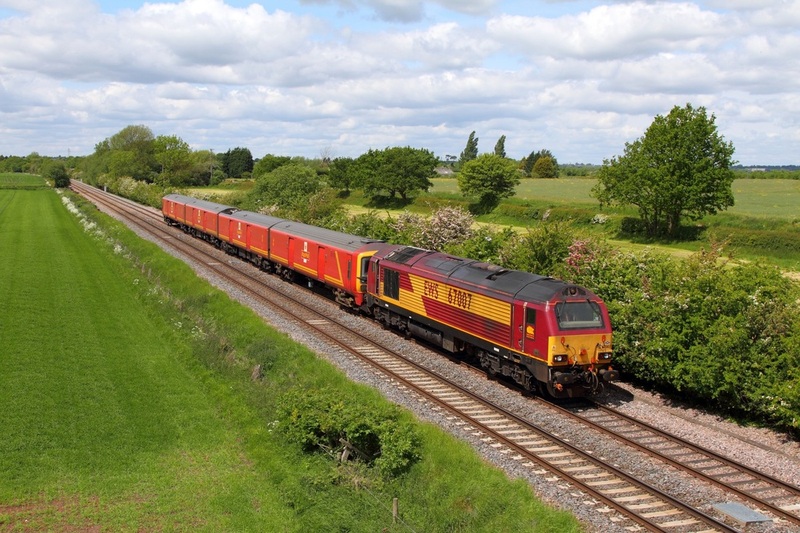 The only class '67' to so far carry the house colours of DB Schenker is 67018. 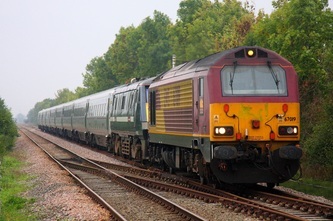 This skip has been mainly confined to Loco-Hauled Passengers services recently and is often allocated to a Chiltern diagram. The loco carries the name "Keith Heller" and wears a Canadian Maple leaf on the bodyside next to its large DB Schenker branding. 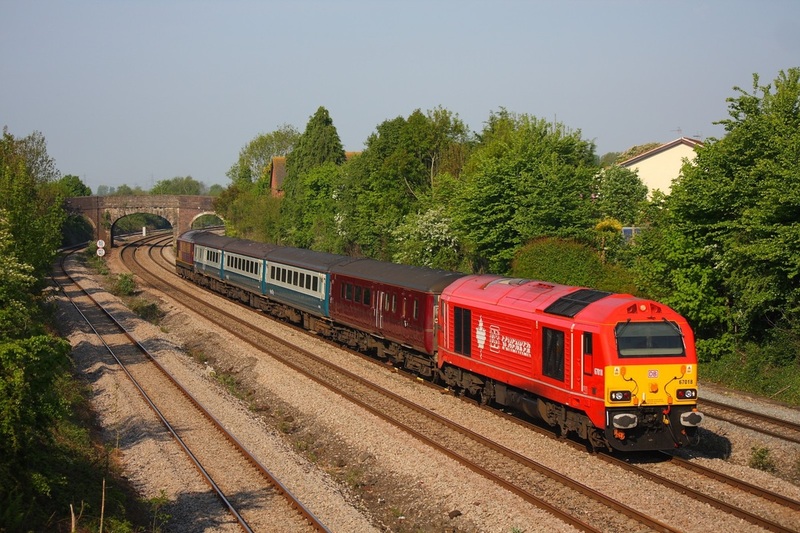 On the 13th May 2010, the loco hurries through Undy with EWS liveried 67022 on the rear, powering the 2C67 08:00 Cardiff Central to Paignton.